These long-legged spider cookies are quick to make and fun to eat, thanks to a chocolate sandwich cookie perched on top. What You Need: 1 cupcake, baked and cooled; white or off-white icing; orange paste or red and yellow liquid food coloring; chocolate sandwich cookie (such as Oreo; we used Joe Joe’s from Trader Joe’s); black licorice whips; cinnamon imperials (red hots). How to Make It: Tint icing orange and frost cupcake orange. Cut licorice into eight equal lengths and press four into each side of the cookie. Use dab of icing to attach red hot eyes to cookie. Place cookie on cupcake. Couldn’t be easier! 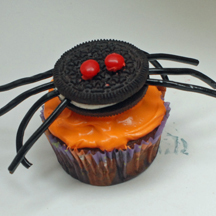 This entry was posted on Monday, September 24th, 2007 at 8:54 am	and is filed under Halloween cupcakes, insect and spider cupcakes. You can follow any responses to this entry through the RSS 2.0 feed. Responses are currently closed, but you can trackback from your own site.